OSWEGO, NY – Resource Development Director for United Way of Greater Oswego County Ali McGrath welcomed Sean Ohnmacht, owner of Greene’s Ale House, as the newest restaurant to take part in the United Way’s 10th Annual Stone Soup Luncheon. 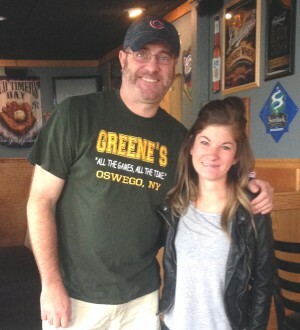 Greene’s Joins Stone Soup Luncheon. Greene’s Ale House will spice up the menu with the addition of its Buffalo Wing Chili. The menu for the Stone Soup Luncheon also includes past favorites from Canale’s Restaurant and The Oswego Country Club; Italian Wedding Soup from Vona’s Restaurant; Chicken Tortellini from The Press Box; and Broccoli and Cheddar from Bridie Manor. United Way invites community members to join them for the 10th anniversary celebration of its annual luncheon beginning at 11:30 a.m. on November 12 at St. Joseph’s Parish Center, West First Street. United Way will be accepting a donation of $5 per person and those attending are urged to bring a donation of non-perishable food items. All proceeds from the luncheon and all food donations will benefit the food pantries at Human Concerns, Salvation Army, and Catholic Charities of Oswego County as well as the Hannibal food pantry.